I made this cake for my friend's birthday. I made it with another friend of mine. I know it kind of looks like it's slouching down but the other stuff is good. The inside cake is chocolate-vanilla-swirled with vanilla buttercream and bits of crushed up Oreos. It was yummy! We used brown sugar as the sand. 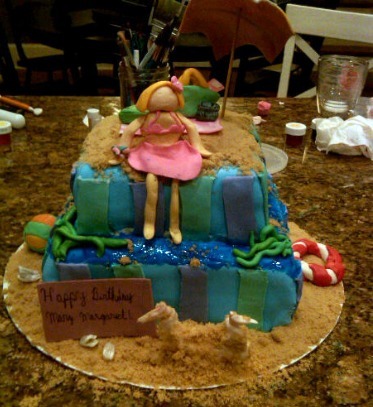 We even sculpted my friend in a bathing suit! She has a bag, cell phone, towel, bracelet, and umbrella. We used blue gelatin for the water and rolled out green gum paste for the seaweed. We have a sand castle, beach ball, and even small shells! She loved it!